This Enonic XP application adds Open Graph, Twitter Cards, Google Search Console, and Canonical meta-tags to your Enonic XP site. It also let's you fully customise your site's title tag, meta description, and social media sharing image. By applying mixin fields to each content you can easily improve your SEO and social sharing presence for your sites and apps. New: configure the app from configuration files on the server. Credit @edwardgronroos of TINE SA. Fix: Inject the `og:` namespace prefix definition in the `<html>`-tag automatically. New: Possibility to override/add custom image per content. Improvement: Automatically skip converting images to JPG if it's a SVG being used. 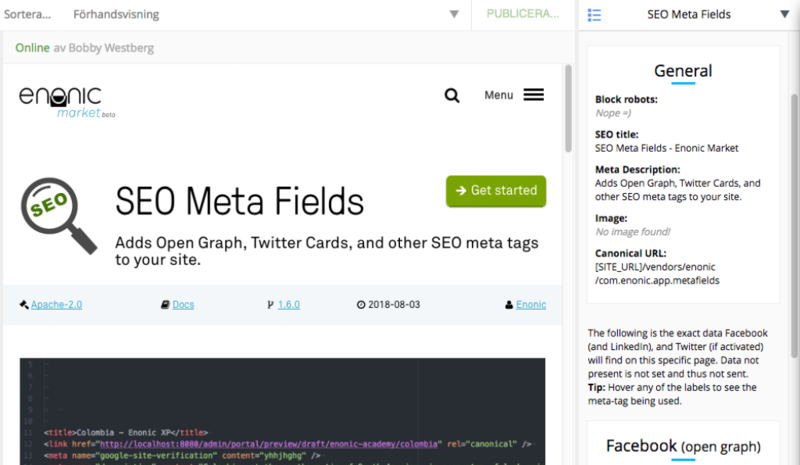 Changed: Fieldset display-name is now only "SEO" instead of "SEO Metadata". Changed: Using new x-data format making SEO fieldset optional. Added config option to return separate fallback image for frontpage. Added config option to return raw (unscaled) fallback images for both frontpage and normal content. 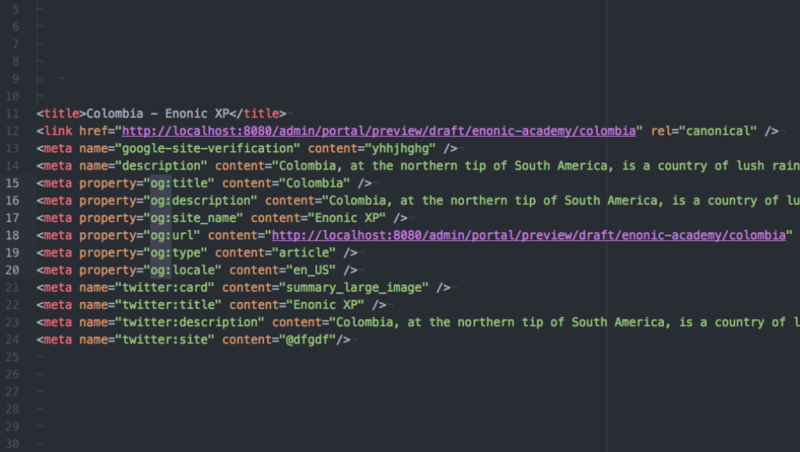 Using HtmlArea as description basis now possible, tags stripped. Changing the label for "hide from search engine". Handle nested userDefinedPaths and non strings when overriding title. Bug fixed - don't intercept content types other than html files. Can cause crashes on websites generating XML or JSON. Improve title behavior on clean installs of the app. Get 5 days free hosted version of "SEO Meta Fields" application for Enonic XP.